We wanted to share a few of our favourite underwater self portraits tricks with you too! So we thought we would devote the next couple of posts to include some of our own images and tips on shooting underwater self portraits! So what if you’d like to take a self portrait in the water and don’t have a human tripod available? Or maybe you’re in the ocean so there’s nowhere to secure your camera to and use a self timer? I loved swimming in the ocean while pregnant and knew I wanted to capture this to remember that feeling. So, with my 24mm wide angle lens, I turned my camera/housing around to face me in true selfie-style! I held it out with both hands as far as I could, and used the reflection on the dome port to gauge my composition. Taking lots of shots helps to make sure you capture what you’re going for! I love having this memory hanging on my wall, and winning an award for it was a little cherry on top. For an ocean selfie with my waterbaby, I took advantage of the housing’s buoyancy and let the camera float at the surface while operating the shutter button with one hand. This is of course limiting in the kind of shots you can get, but it’s about capturing the moment more so than perfection. Because the best photo is the one you actually took, right? As we start up another new year, many of you may have planned personal projects. We LOVE personal projects here at Underwater Kids and believe if you really want to see growth and development in your photography, there is NOTHING like them to get you started! But what about getting you in front of the camera as part of those personal projects? I know, I know, there is a reason why you are behind the camera. Believe me, I am with you....but lets just say you give it a try. And then let's say you want to try it underwater? How do you even begin? We have asked a few of the most incredibly talented photographers we know to share their favourite underwater selfies and give us a few tips on how they accomplished them! 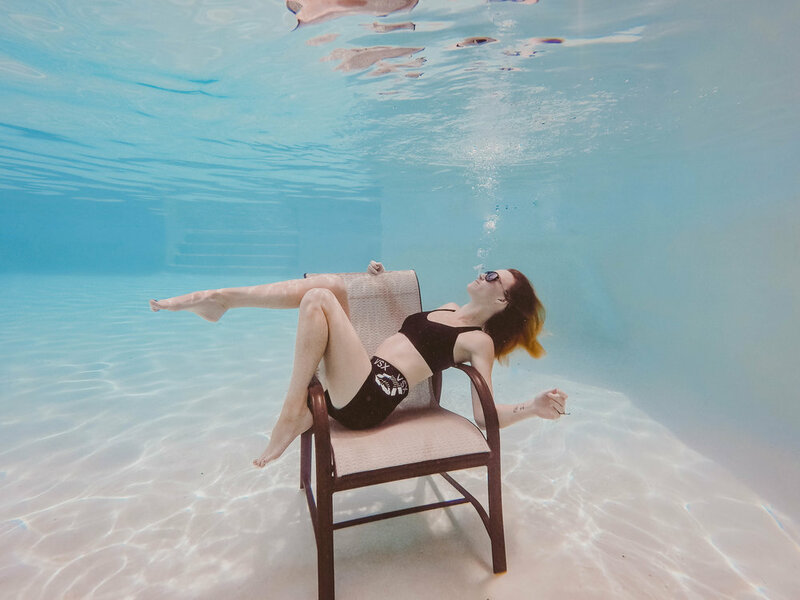 First up, the fabulous LeAnna Azzolini with her incredible pictures and a few tips on getting started taking those underwater self portraits. Just gorgeous right? We asked LeAnna for a few tips on shooting underwater self portraits and she had this to say. It’s always been a dream of mine to learn underwater photography. When my daughter was born, I immediately had visions of swimming out in the ocean capturing her surfing alongside her Daddy. She’s still young though, and we’re starting small for now. This summer, she was three and we finally reached a point where it was safe for us to swim next to one another in the swimming pool. At the beginning of 2017, I began a journey with a self-portrait group and underwater photography was my main goal to incorporate into my project. I’d had shots planned in my head for years and thankfully my husband was able to hold the camera and help me to jump in the frame with her. Our underwater shots ended up being some of my favorites throughout the 52 week process. I’m still learning how to handle light and to maintain a consistent and cohesive look with my editing. That’s my biggest challenge. Colors are very different to work with and the way the light shines differently during the day still throws me off. It’s quite a learning curve for me so far. I’m completely hooked though and plan on sticking with this in the years to come. My next big dream is to get in the ocean and see where it takes me. We next asked the incredible Chelsea Cronkrite to share some of her favourite tips for taking self portraits underwater. This is what Chelsea shared with us. Practicing sinking and breathing techniques will help you keep your cool when shooting underwater. 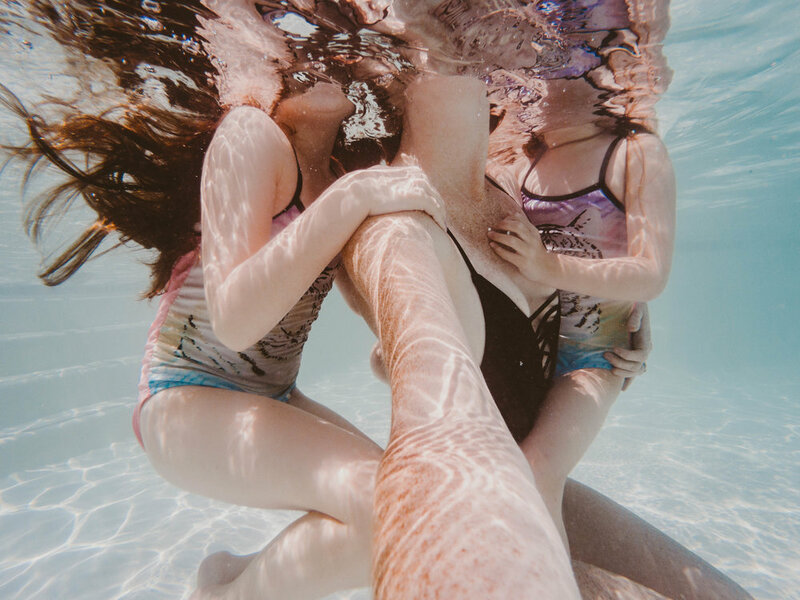 For taking self portraits, fully submerging your Go Pro Hero 5 sticking it all the way at the bottom of the pool facing can help make for a cool dome effect. Also shooting with it on a stair case or a ladder can help create other cool perspectives. If you have a split level dome, those help make for some pretty epic selfies as well. Using a bendy tripod can also up your self portrait game. Thanks to both of these incredible artists for sharing their thoughts and their work! Stay tuned for one more blog post about tips and tricks for self portraiture underwater next week! !